There are music programs. And then there is ACID. Experience the bedrock of music production – for free. 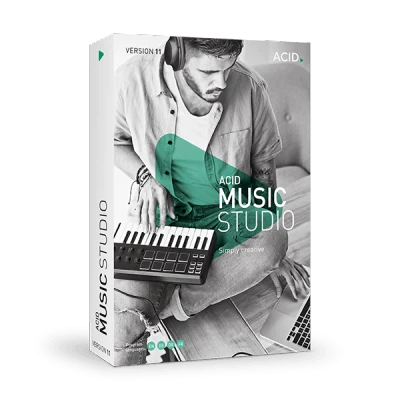 Download the free ACID Music Studio trial version and try loop-based music production for yourself. 3,000 ACID loops and 90 virtual instruments create the base for creative music arrangements. Current features including real-time pitch/tempo transposition, unlimited tracks, and our signature pick/paint/play interface all make the ACID Music Studio free version an ideal program. ACIDized loops are more than just pure audio files. In addition to length and transients, they contain information on the key of the underlying samples. Ideal conditions for finding just the right sound. More than 3,000 ACID loops and 90 virtual instruments. Lots of tools for audio editing Everything you need for creative music production. At first glance, the mixing board in the ACID Music Studio looks like a typical analog mixer. Expanded routing options now allow for a more flexible studio recording environment. For remixes, use the impressive beatmapper. Or use the Chopper for just enough dynamics in your tracks. For this, you'll find countless DJ effects, drum fills and stutter effects. All this speaks professionalism: Track folder and editing groups for optimized editing and efficient pitch editing. Still not enough? Create dynamic switches with the tempo track. After, you can easily export everything in just the right format. Burn directly from the timeline. Simple encoding in all standard formats. Easy upload to the web. Everything directly from ACID.